Our home inspectors consultation is unbiased so you can make informed decisions. 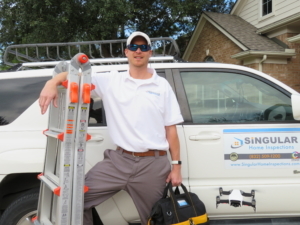 Singular Home Inspections provides premium home inspections for buyers, sellers, real estate agents and property investors in the greater Houston area. We provide our clients with a professional service and a commitment to ethics helping our customers to make informed decisions. We make the home inspection process easy, affordable, and you get clear results. Our home inspector will answer your questions during the scheduling process. We schedule a time that best suits your needs. We provide a detailed easy to read report typically the same day. If you are unable to attend the actual inspection we will consult with you over the phone while you look at your report to answer any questions you might have. To schedule an inspection fill out our online scheduler below. Or call (832)509-1200 if you have any questions before scheduling your inspection.